I’m gonna sit right down and write myself a … postcard? 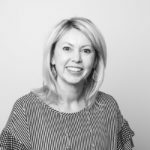 Frank Sinatra wrote the original song “I’m Gonna Sit Right Down and Write Myself A Letter,” but that topic can include postcards, too—a cost-effective way to generate response and heighten interest in a face-forward interaction. Postcards let you deliver your message quickly and impactfully in a content-heavy environment where multiple messages are viewed virtually every second. In fact, many marketing experts estimate that most Americans are exposed to around 4,000 to 10,000 ads each day! And postcards guarantee virtually 100% deliverability with powerful messaging, typically using short copy with large, bold visuals. Best of all, you can re-direct the recipient to take an action online or via phone, especially for supporters who have already shown a propensity to respond in those channels—even if they’ve opted out of email or telemarketing before. Take Action! A call to action should be clear and concise. The audience needs to be able to know immediately what the postcard is asking them to do. Directing them online to find out more information, make a gift or participate in an event are all specific call to actions. Who should we mail? Profiling the audience using characteristics that are reflective of the offer is the first step in making the select. Data variables may possibly include adding supporters with high-Internet propensity from other sources, an especially useful tactic to drive donors online or if you don’t have their email or if they’ve opted-out. Many marketing experts estimate that most Americans are exposed to around 4,000 to 10,000 ads each day! 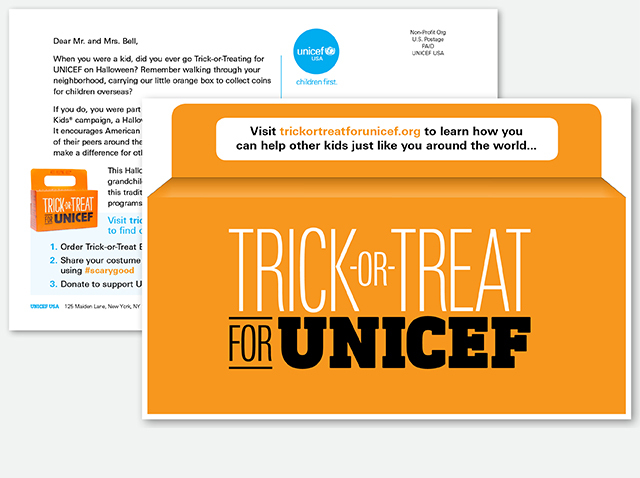 UNICEF USA recently used postcards to promote specific campaigns across multiple channels, primarily aimed at non-email recipients. The postcards aligned with the organization’s goals, driving donors to a content-rich landing page (URL) and request to capture emails. Back to School, Trick-or-Treat for UNICEF and Kid Power were three of the programs promoted by postcards to broaden their reach. Other online activities, family presence and high-wealth indicators were used to target donors who were not receiving email promotions from UNICEF USA, with variables that included social media activity, online shopping, married households, presence of children, and household income. Next time you have a message that calls for action, try delivering a postcard to stand out in the mail!